The mainstream media spends, what seems like at times, 24 hours per day having guests on discussing the benefits and drawbacks of the tax rate that we should apply to the rich. Then they discuss the tax rates we should apply to the middle class, and then they move on to the poor. They will show fancy info graphs provided by ivy league graduates and bring in both sides of the argument to debate. Imagine a family with monthly expenses close to $4,000 per month (very common in a middle class family) that spends four hours every night after work arguing over which brand of bananas they buy at the store. The husband wants to purchase the brand that costs 30 cents less. The wife would like her family to enjoy name brand bananas and wants to pay the 30 cents more. The husband refuses to budge on this additional "tax" on the family's income every month. Some would look at this family and argue that it may be more important to focus on reducing the $4,000 in monthly expenses. Hold that thought. Rick Santelli takes this simple analogy and applies it to real life. The video below demonstrates the benefit of having or not having tax increases on the rich (buying the cheap or inexpensive banana) and its impact on the total federal budget deficit (the $4,000 per month in expenses). Santelli describes the endless tax discussing perfectly as a "bait and switch," otherwise known as "misdirection" or what a magician uses to fool the audience into paying attention to the wrong object. 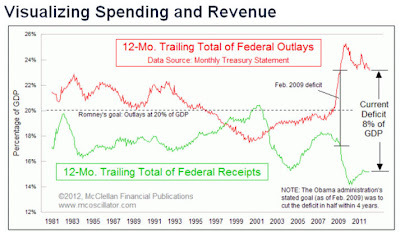 This misdirection through endless fancy graphics and emotional arguments on television makes it difficult for the audience to clearly see that we have a spending problem not a taxing problem. Jim Chanos, who stood alone 24 months ago when he began to amass a massive short position on China (specifically China real estate), just as he stood alone when he took a massive short position against a company named Enron 11 years ago, spoke with CNBC this week on both China and shorting. Similar to Enron, which collapsed unexpectedly and entered bankruptcy creating a windfall in profits for Chanos' positions, China real estate is currently in free fall and his shorts are once again rocketing higher in value. Then the discussion on shorting stocks in general. With the world continuing to understand that there are major problems brewing in Europe, the spotlight in the mainstream media today has temporarily moved back to Italy as their 1 year bond auction this morning saw prices rise from 1.405% (previous auction in March) to 2.84% today. This is the equivalent of putting your home up for auction in March and receiving a high bid for $300,000. Then your neighbor puts their home up for auction in April and receives a high bid of $150,000. It creates a worrisome sign for the trend in the neighborhood. But enough of Europe's debt, let's have some fun today. Chartfest! 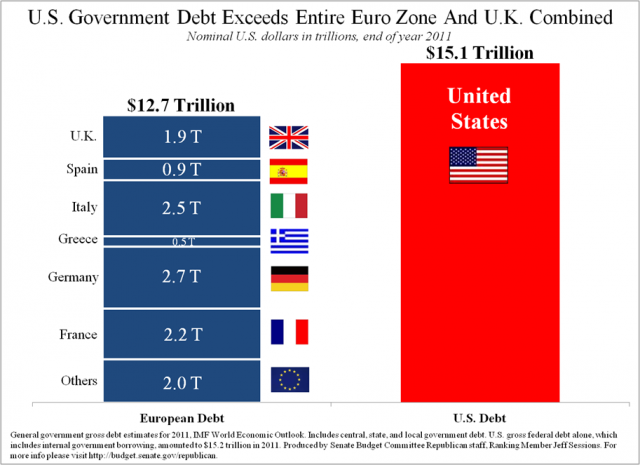 To begin we have a fun chart that shows the size of US debt against all of Europe and the UK combined. 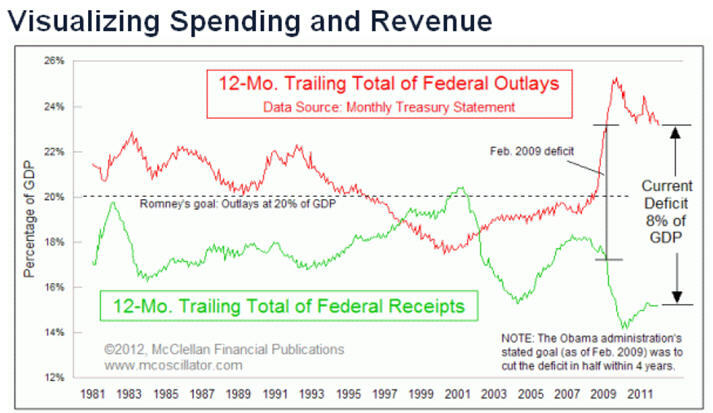 Next up we have both spending and tax receipts in America as a percentage of GDP. Mind the gap located beyond 2008. For those that have read or watched Chris Martensen's "Crash Course," you understand the importance of a parabolic curve. 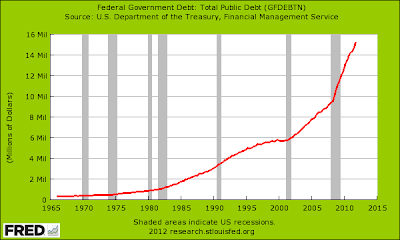 We now have a new one, along with money supply and population growth: the US federal deficit. Just wait until interest rates rise and the "magic" of compounding interest is applied to this equation. 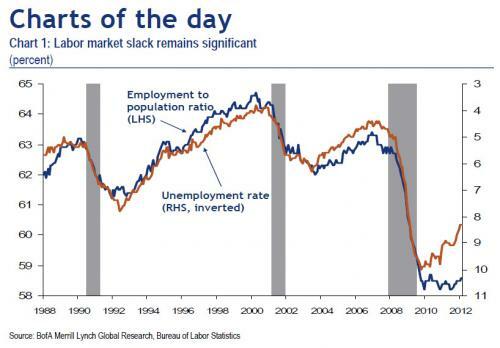 The following graph shows unemployment vs. labor rate. You can spot the divergence in 2009 when employees began "giving up" looking for jobs creating the artificially low unemployment rate sitting at 8.2% today. The real number should be at least 2% higher (above 10%) and even higher from there when counting those taking temporary part time jobs that do not cover monthly expenses. 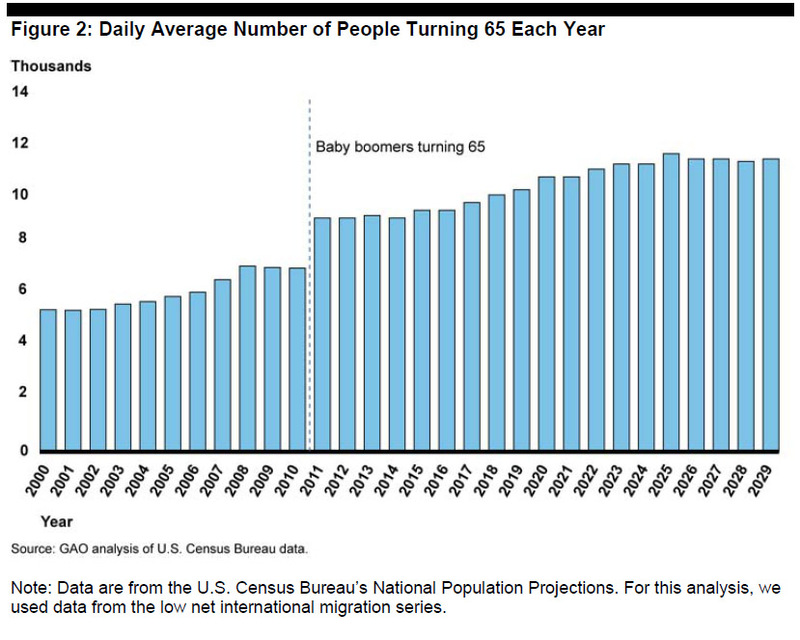 Next up we have the number of people turning 65 per year in America. You can see the jump up beginning in 2010 and the steady rise from there. For the impact this will have on the real estate market see 2012 Real Estate Outlook: Demand - Willingness. This will also impact the stock market as those that have steadily contributed to a 401k over the past 40 years will now be steadily withdrawing (selling stocks). Remember that 401k's "force" a percentage of assets to be sold every year once baby boomers hit a specific age. 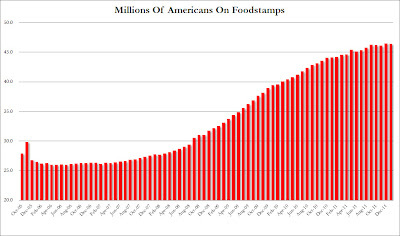 The following shows the growth in food stamp usage since the depression began in 2007. The monthly allowance every month has begun to fall as the cost of food continues to rise. Look for those two trends to diverge in a violent setting in the months and years ahead. Another quick look at stocks and earnings which we discussed yesterday, with the graph below shows the S&P performance against the expected S&P 500 earnings growth rate for quarter 1. 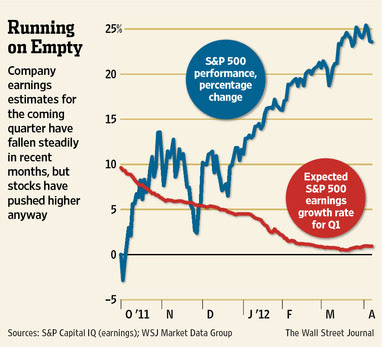 Real earnings have continued to fall as stock prices continued their rise. 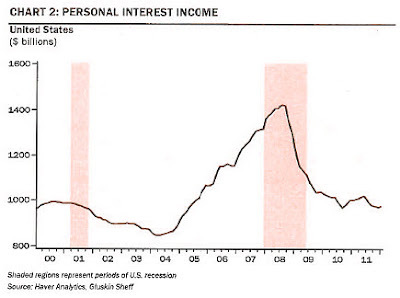 The next two incredible charts come from David Rosenberg. The first shows the money savers have lost due to the Fed's low interest rate policy since 2008, meaning the interest they would have collected if Bernanke had not artificially pushed rates lower. It equals $400 billion per year and over $1 trillion total since 2008. Imagine how Americans would feel with an extra $1 trillion in cash in their pocket (and most likely a much lower cost of living as the value of the currency would have reflected higher rates). Then you have where investors have been forced to put their money instead. With no rate of return possible through savings the money has been forced back into the casino of the stock market with the allure of dividend returns (even at only 2% or less). The problem with this? See the fall of 2008. 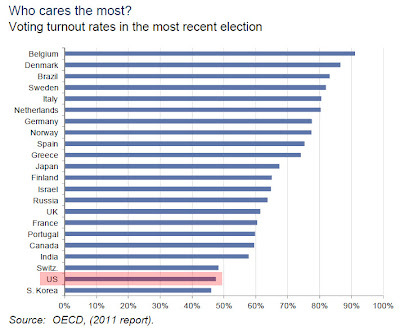 A quick look at the political world in the graph below shows voter turnout in the United States compared with the rest of the world. 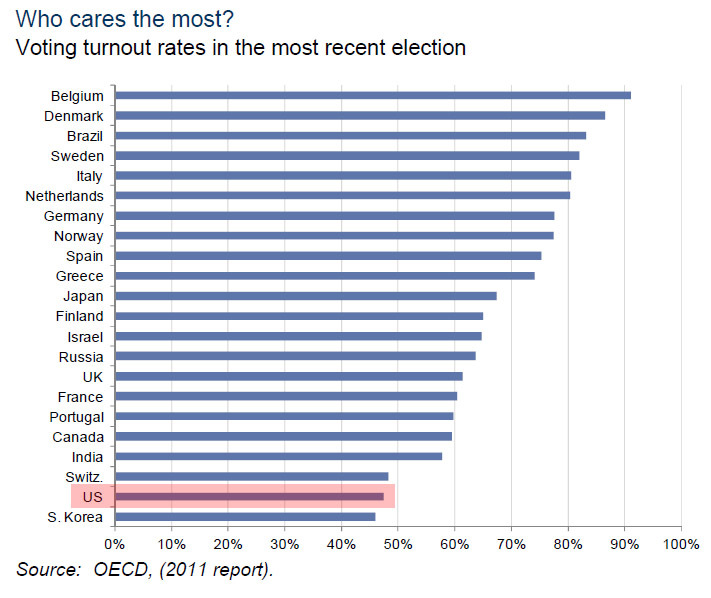 Less than 50% of eligible citizens actually show up at the ballots. Why so low? 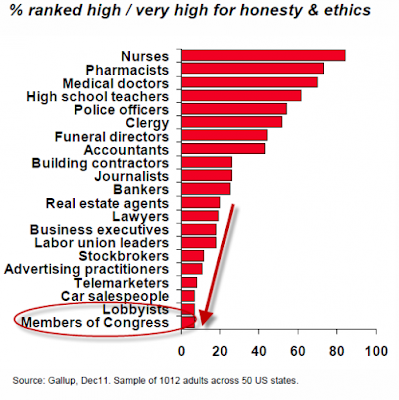 Here is where Americans rank members of Congress in terms of honesty & ethics. Perhaps more and more people are coming to the conclusion that Obama and Romney, Democrats and Rebublicans, are one in the same. 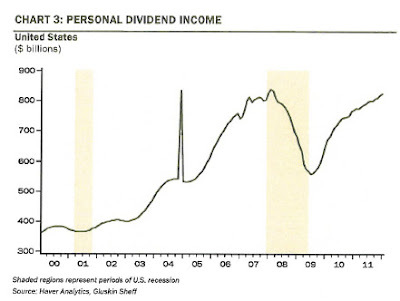 The following chart is stunning. It shows the total global debt to GDP around the world. 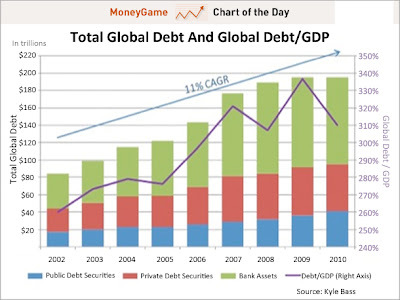 Total debt has risen from $80 trillion in 2002 to just under $200 trillion in 2010. Debt to GDP ratios have risen from 285% to 335%, which shows you how dependent the global economy has become on credit growth. 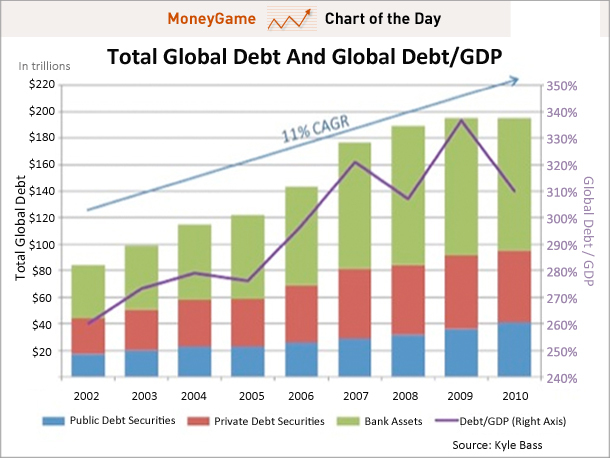 Somehow this debt must either be defaulted on or inflated away in order to get back to sustainable levels based on current global income (how debt payments are serviced). 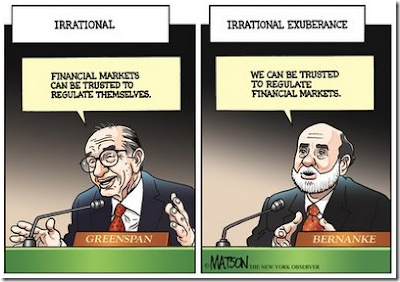 Lastly, I will leave you with Alan Greenspan's famous "Irrational Exuberance." One of my absolute favorite authors and speakers on economics is Richard Duncan, author of the bestsellers "The Dollar Crisis" and "The Corruption of Capitalism," both of which have predicted the future we live in today. 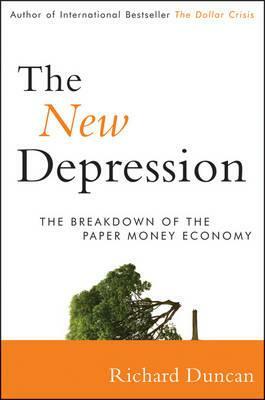 This month he released his new masterpiece called "The New Depression," which is an incredible in depth analysis on both how the global economy got to where it is today and the possible scenarios we face moving forward. He is rather bullish on the short term opportunities for the United States in terms of their ability to finance government spending at ultra low interest rates allowing them the opportunity to create programs that will benefit both the US and the global economy as a whole. For an extremely well done and thought provoking speech he recently gave for the CFA Institute in Hong Kong (charts are provided throughout the speech) click on the link here. This past week he also gave a lengthy audio interview (mp3 and iPod download) discussing his new book with Jim Puplava on the Financial Sense Newshour which can be heard here. As Spain is now collapsing (bond yields at 5.98% and the largest bank shares halted in trading due to prices in free fall) and the media today discussing all the issues we have already presented here previously, it is a good time to take a moment to move back across the pond and look at the status of US stocks. The goal here, as always, is to continue to look forward. The stock market, after entering the year at over inflated prices and then skyrocketing from there into the stratosphere, appears to have temporarily found a moment of gravity. If this is some sort of short (or long) term top is obviously unknown as dealings with euphoria and hysteria at these levels has only been seen back in 1999 and 2007. Prices of stocks today are based on analysts assumptions of where earnings will be 12 to 24 months out. If analysts believe that stocks next year will have earnings growth of X percent, then the stock price is bid up to reflect that price today. That is why when earnings are released, even if the company had a strong quarter, the stock can sometimes fall because it was below expectations that were priced into the stock 6 to 12 months before the earnings data was released. With this understanding you can look at forward earnings estimates and the important profit margins to determine how optimistic or pessimistic analysts are today. 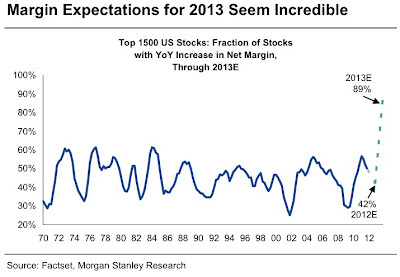 The chart below shows where analysts have forecast profit margins will move into December 2013. You can see that profit margins are currently sitting at record (well above bubble level) highs, but the analysts have projected and priced in these margins leaving planet earth and heading toward the moon. How is this possible? Not only does the overall economy have to have growth surging, but companies themselves have to all have their management and systems creating new ways to lower expenses and increase revenue (profit). Sound like an over exaggeration? 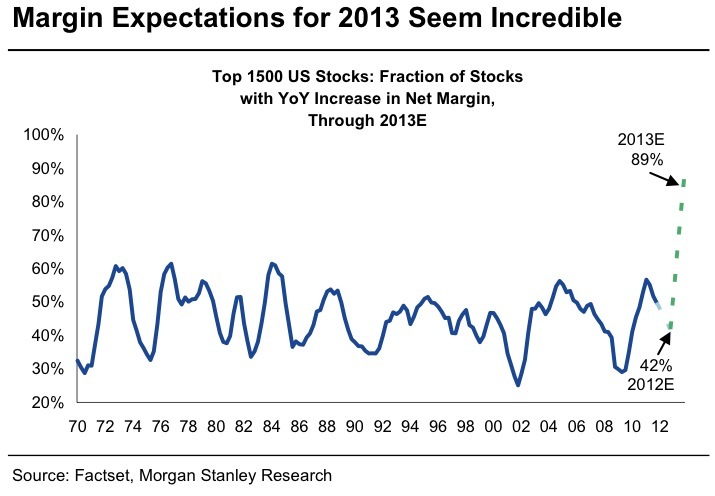 Here is the market expectation for the percentage of companies that will increase their margins in 2013. 89%! This means that with margins already at beyond bubble extremes, that 9 out of 10 companies will grow from here. 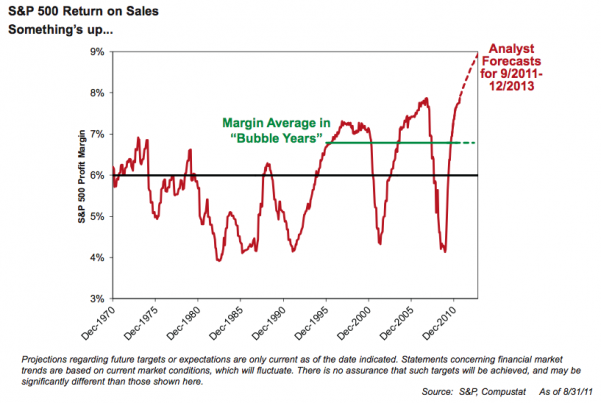 Notice that back in 2009 only 30% of analysts thought that companies would see their margins grow the following year. The stock market was at its lows and the psychology in the market was in the trough. With earnings already coming off a waterfall decline, and companies still having the ability to make major management changes to reduce expenses, this was the time every analyst should have be bullish on the possibility for margin growth. The market, of course, does not work that way. Because of general herding behavior found in all human psychology, it has the ability to fool most of the participants at its peaks and troughs. I enjoy turning on CNBC for about 20 minutes a day just to hear the discussion on stocks. People are terrified to say that someone should not own a specific stock or market index, which is the exact opposite of how analysts felt at the lows. Can the market roar higher from here? Of course. And the insanity would grow louder. The small minority that can drown out the noise have had an unbelievable opportunity to exit positions at sky high prices and have even had the opportunity to purchase short funds such as BEARX that would wake up quickly if gravity were to return. For more on the European debt crisis see Applying The Greek Blueprint To Spain & Beyond. 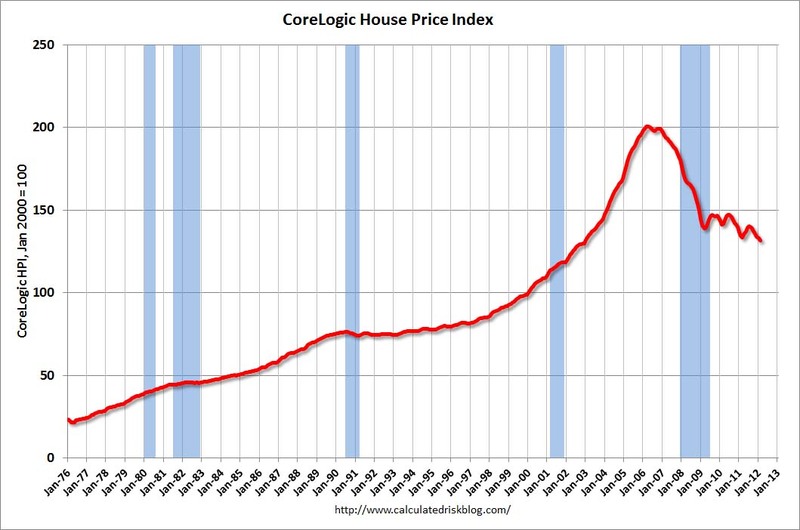 Bloomberg On The London Whale "Voldemort"
Corelogic released their US home price index for the month of February this week showing that prices have reached a new post bubble low. The following chart shows the collapse of home equity for Americans since the bubble burst in 2006. Americans have now lost close to $122,000 per household in equity that they were counting on for retirement. 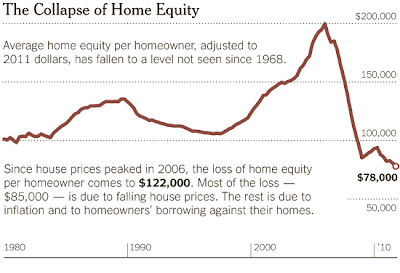 Home equity prices are now back to 1968 levels, essentially erasing any "value" in home ownership since that point. 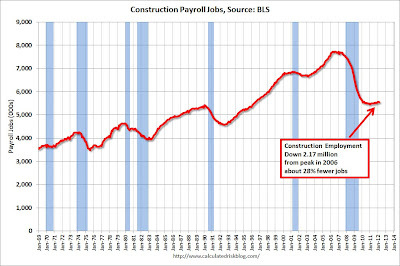 The next chart shows the loss in construction jobs since America's depression began back in December 2007. 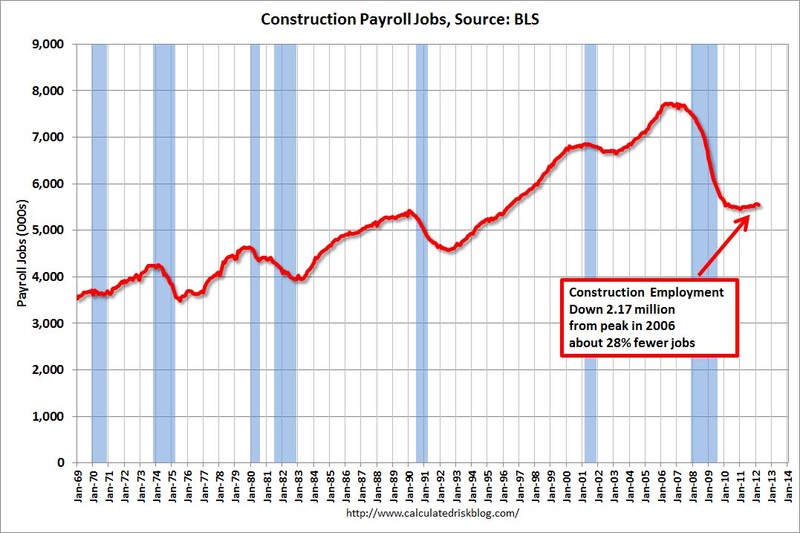 Almost 1 out of every 3 jobs in construction have disappeared. Where do we go from here? Reuters released an excellent article this week discussing what is in store for US real estate foreclosures (link below). Back in late 2010 the real estate market was hit with the "robo-signing" scandal when it was discovered that documents were fraudulently created to sell multiple issues of the same mortgage to investors. 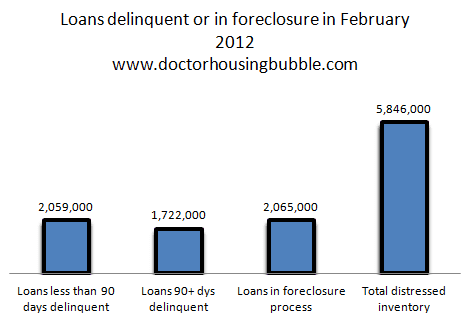 Over the past 18 months there has been a massive slow down in foreclosure processing while banks have tried to work out the messy details (you cannot foreclose on a home "legally" unless you know who actually owns it). 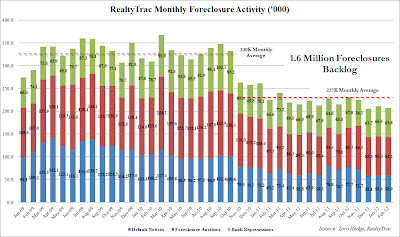 The following chart shows data released from RealtyTrac on the the rate of foreclosure filings pre-robosigning and post-robosigning. 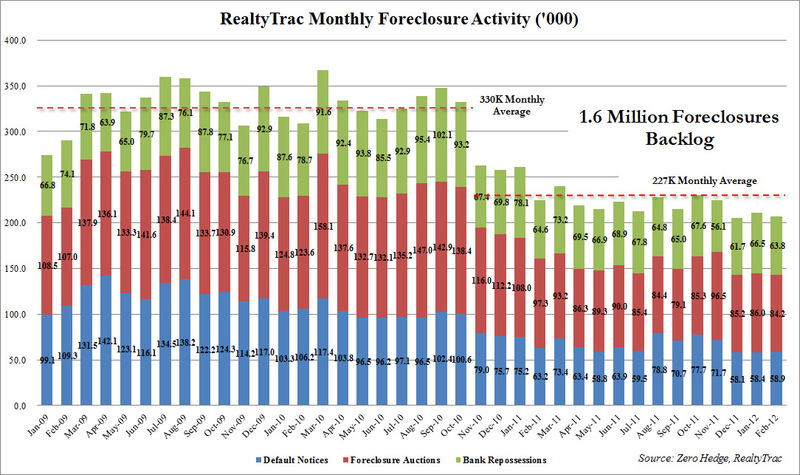 You can clearly see the drop off moment when close to 100,000 less homes per month began the foreclosure process. The consequence: a longer period of time for those Americans living payment free (economic stimulus) and an increase in the supply of shadow inventory (postponing coming price declines). The process a home moves through before arriving on your street as a bank owned property for sale is known as the distress inventory pipeline, seen in the graphic below. The first two columns are unseen in the MLS listings (which are falling in some areas and artificially signaling a recovery). Some of these homes may have people living in them that have the good fortune of living payment free every month. 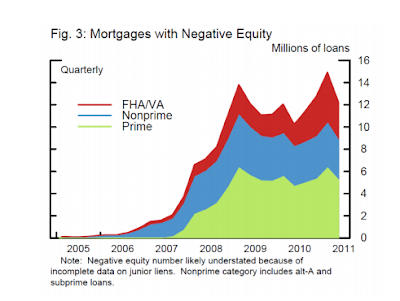 This graphic does not include the homes that are underwater and still making their mortgage payments. How large is this pool of homes? Zillow reports that 28% of homes with a mortgage are now underwater as of the end of March. Please re-read that statistic. Here is an excellent way to visualize the growth in size of this underwater pent up future supply (graph below does not even include second liens on homes). 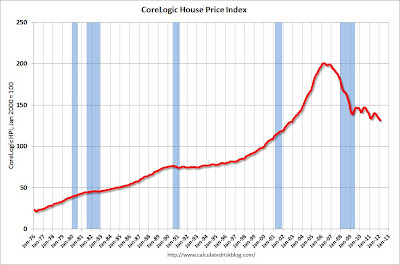 For much more on the real estate market see 2012 Outlook: Residential Real Estate. From October 2011 to March 2012 the European Union spent months holding countless meetings on how they would handle the bailout structure for tiny Greece which represents 2% of Europe's total GDP (think of a small state running into trouble in the US). As I mentioned both before and after the bailout agreement was finally struck, Greece's bailout itself had little importance on the global financial system. What was extremely important was the first blueprint created for each additional sovereign debt crisis in Europe moving forward. To sum it up in very simple terms the blueprint now looks like the following outline. For those unfamiliar with the terms LTRO and Credit Default Swaps (CDS), I have provided links below that walk through these topics in a step by step, easy to understand manner. 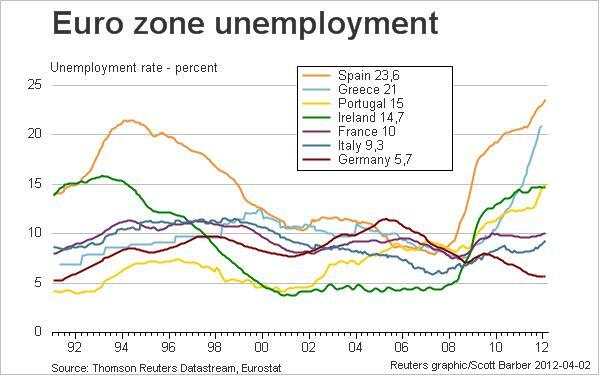 It appears that Portugal, Italy, and Spain are all slowly moving together toward the abyss. Just like Greece, they have debt burdens that are suffocating their ability to grow. Back in late 2010 I wrote an article titled Up Next: Portugal and Spain, discussing that after the Greek and Irish bailouts (which were commencing at the time) that the crisis would move to Portugal followed by Spain. I believed at the time that Italy would follow Spain. 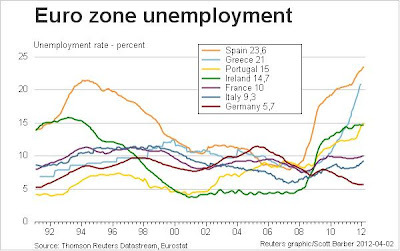 In 2011 we found out that indeed Portugal was next as their rates began to follow Greece's upward trajectory perfectly (only 1 year in lag), but it was Italy that moved ahead of Spain in the spotlight. For a time, I thought Spain was going to be allowed a temporary pass as all the discussion in late 2011 was focused on the Italian bond market. After LTRO 1 and 2, the spotlight has moved back away from Italy temporarily and is now shining bright on Spain (it never left Portugal) meaning that they have once again moved ahead in the race for who is "next." While Spain's government debt to GDP ratios are not currently as bad as Italy they have many major headwinds crushing their economy. The first is the continuous collapse of their real estate sector, which in turn continues to crush their banking sector, which in turn will need government support (all of which the bond market is eyeing like a vulture). Over 20% of all real estate loans in Spain are delinquent. Construction firm delinquencies are at 17.65%. Estimates show that of the 400 billion euros (520 billion dollars) of loans made to the residential real estate market, 80 billion euros (104 billion dollars) are toxic. 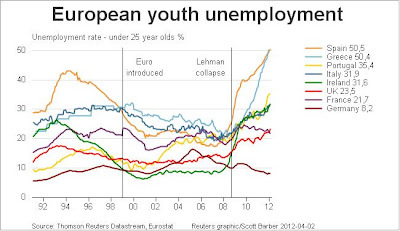 There are only an estimated 50 billion euros to cover these bad loans creating a 30 billion euro troublesome gap. Spain housing starts are now down 94% to end 2011 (evaporating jobs in this sector) and new mortgages are down 81%. When looking at unsold homes sitting in the country, including bank owned, secondary homes, and unfinished units, estimates place the inventory at 1.5 million. Based on the size of their population, this would be the equivalent of America having 15 million homes sitting for sale. Spanish home owners cannot walk away from their underwater mortgages like they can in America. 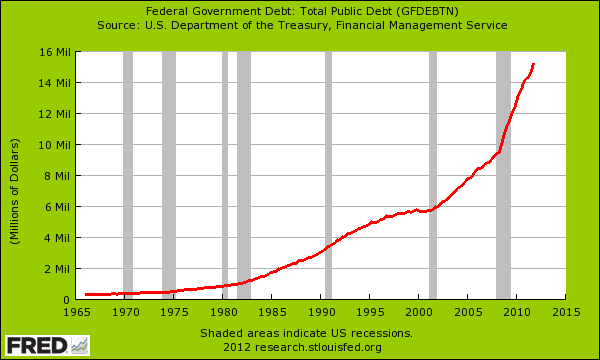 The debt hangs around their neck like a noose (this death trap is only seen in America through student loans). Spanish private (non-government) debt to GDP is now at 220%; they are drowning in debt which is a relentless negative driver of growth and government tax receipts. On top of the real estate market there is regional government debt in Spain, which has risen to 36 billion euros, up 38% since the financial crisis began. As local governments pushed spending higher through bond sales while tax revenues have been plunging it has set up another sector of the market that will need central government support (those living or investing in America which also has bankrupt state and local governments, please pay attention to how this process unfolds). In addition to the real estate sector and regional government debts, the overall economy (the revenue source needed through tax collection) is a disaster. 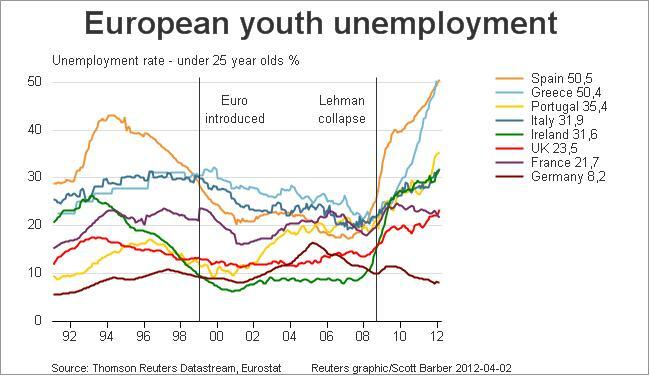 Unemployment has moved relentlessly higher, now hovering close to 24%. On top of the massive debt losses that are coming for the Spanish banks through the real estate sector, there is another point of interest that is often overlooked by analysts. After the recent LTRO programs, (see above links for explanation) Spanish banks were provided an unlimited amount of free cash at only 1%. We have seen that the majority of the buying of Spanish government bonds (which has pushed the yields downward over the past few months and created the artificial impression that the crisis has passed) has come from Spanish banks themselves. They have employed a "carry trade" on the money lent, which was the ECB's goal when the program was created, by borrowing at 1% and reinvesting in Spanish bonds yielding 4% or more. They then pocked the spread creating the carry trade. What is the problem with this? 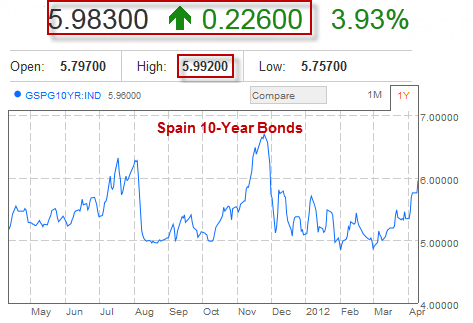 Now that LTRO has passed, Spanish government bond yields are once again beginning to rise. This means that banks that doubled down and went all in on bonds with the cash are now underwater on their investment. If rates continue to rise, they will need massive government support to cover losses on these investments. The final nail in the coffin of Spain will be the massive government debt issuance in 2012. Spain has 186 billion euros scheduled to be auctioned off this year. These auctions will happen every two weeks. This means that Spain will approach the bond market bi-weekly and beg the market for a loan to survive for just a short while longer. The first auction of April was a disaster, which sent Spanish bond yields higher and rocked the markets last week. Spain only managed to sell 2.6 billion euros in bonds (remember they have 186 billion needed to be sold this year) and it took rates close to 6% to get the money. This has the potential to get very ugly, very quickly. Most investors have forgotten about the European situation and now only focus on how high Apple can move the stock market. Just a quick side rant: Apple is up 48% and has accounted for 20% of the total appreciation in the S&P 500. It now makes up 4% of the total S&P 500 market cap and 11% of the NASDAQ index. It makes up 3% of all hedge fund portfolios. We have hitched are wagon to one star. Let us hope that people around the world continue to purchase every iPhone and iPad that is released. The sovereign debt crisis will continue to build in Europe, Japan, the UK, and the United States. 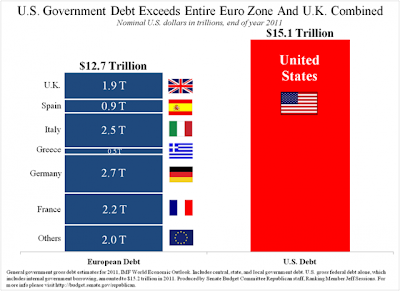 Central banks will continue to counter this suffocating debt with additional printed currency. 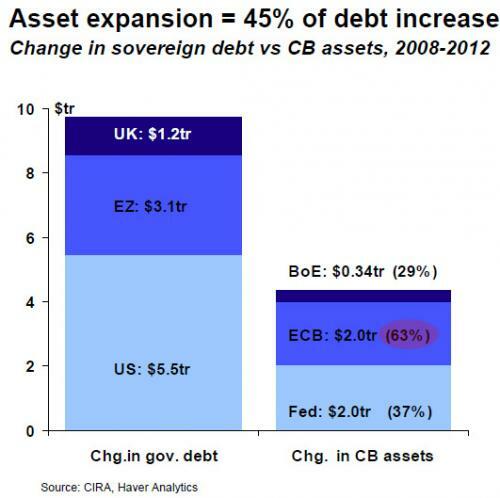 The following chart shows sovereign debt expansion vs. central bank balance sheet expansion. It shows the percentage of government debt growth that has been financed with printed money, and it tells a remarkable story. 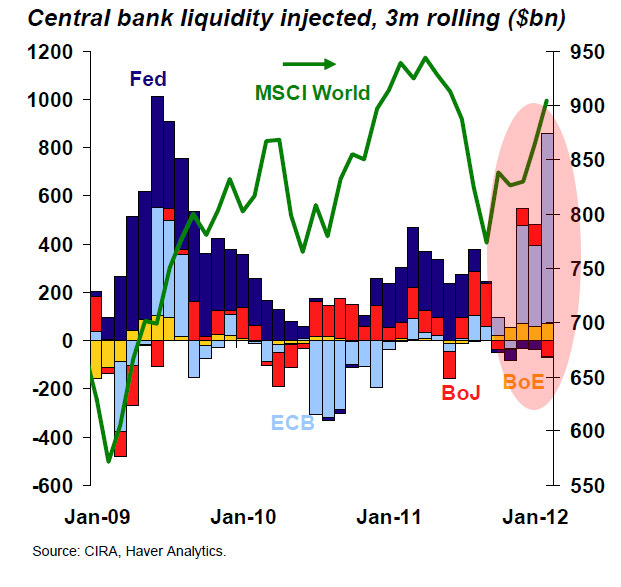 The next chart provides central bank liquidity injections through a timeline showing how they have taken turns "funding" the crisis. It has most recently been the ECB massively expanding their balance sheet through the LTRO programs. Many believe that the Fed is on deck with QE3. What all this means for gold and silver, which have recently taken a beating in the market due to the "crisis now over," I'll leave for you to decide.